We’d love your help. 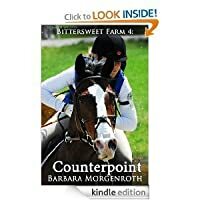 Let us know what’s wrong with this preview of Counterpoint by Barbara Morgenroth. Greer Swope has something to prove. But even she doesn't quite know what. Always believing that even if she was good enough for nothing else, she was good enough on a horse. History hasn't borne that out. Now Greer's left equitation and hunter classes behind for show jumping but it won't happen overnight. It might even take the help of a new trainer. Enter Cameron Rafferty Greer Swope has something to prove. But even she doesn't quite know what. Always believing that even if she was good enough for nothing else, she was good enough on a horse. History hasn't borne that out. Now Greer's left equitation and hunter classes behind for show jumping but it won't happen overnight. It might even take the help of a new trainer. Enter Cameron Rafferty whose horse is lame, who was fired from his last job and who wants the newest Bittersweet prospect. He's one of the top riders and he is a player. Can Greer handle her horse, Counterpoint, and Cam Rafferty, too? Does anyone know what color Counterpoint (Greer's horse) is supposed to be?? Good gravy, I'm hooked! I love these books. There are a few typos in them, but it has a way of pulling you in, the characters are great! A really great book. 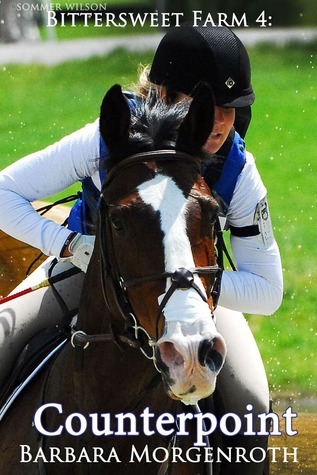 Barbara Morgenroth shows you how each girls grow with their new horses and how they change their lives. This series keeps you wanting and waiting. This book does not disappoint. I love the transition that Greer makes it really will inspire you. Recommended to all those horse loving people out there.